Posted 4:33 pm by Al Broberg & filed under Blog. Most people have heard a diamond described as “certified”. What does it mean to say that a diamond has been certified. Do only the best diamonds get certified? Surely a certified diamond must be better than a diamond that is not certified, right? No, not necessarily. What it means to say that a diamond is certified is that the stone has been sent to a gemological laboratory to be graded. If the diamond comes back from the lab graded I3 on the clarity scale and “P” on the color scale, it will be a certified diamond, but it will be junk. It will have little to none of the optical characteristics that we normally look for in a diamond and think of as beautiful. It will be a highly included, yellowish stone with little brilliance, fire or scintillation. But it will have a lab report. All certified diamonds have lab reports (certificates) that give the buyer an independent third party verification that the stone is a natural diamond, that it has the dimensions, carat weight, color and clarity stated on the “cert”. The existence of the lab report means that the consumer does not have to trust what the sales person says about the size or quality of the diamond. But it does not necessarily mean that it is a good diamond. So the next time you hear that advertisement on TV from the discount jeweler about 3.00 carat GIA certified diamonds on sale for $1.50, you will know that it probably is certified, but you will understand what that diamond must look like. Posted 4:29 pm by Al Broberg & filed under Blog. 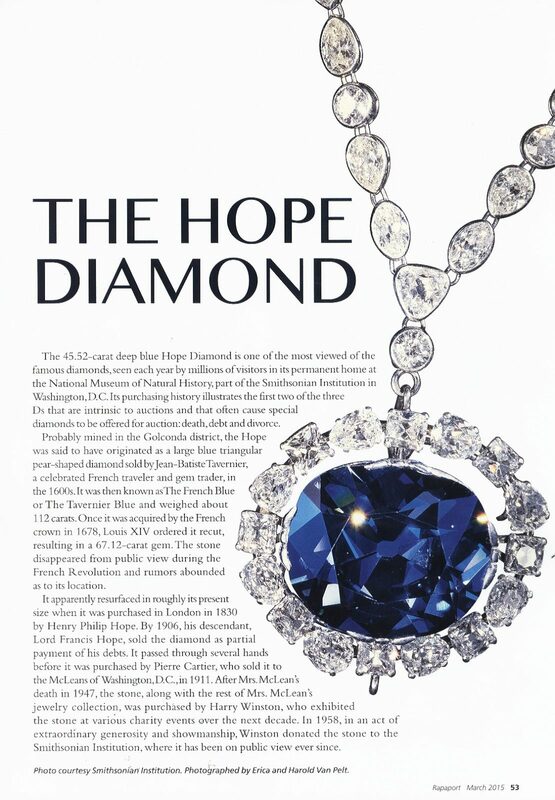 I am going to reprint some short pieces out of Rapaport Magazine on some of the world’s oldest, most famous and historic diamonds. In Europe, these were historically owned by royalty. More recently, in the United States, fabulous and famous diamonds have been owned by Hollywood types or captains of Industry. Posted 2:56 pm by Al Broberg & filed under Blog. There is no SI3 clarity grade in the clarity grading scale of the Gemological Institute of America (GIA). The GIA lab does not issue lab reports with an SI3 clarity grade. But the Rapaport Diamond Report, which is the most widely used price sheet in the industry publishes prices for an SI3 clarity grade and the European Gemological Laboratory (EGL USA) issues lab reports with an SI3 grade. Rapaport and EGL USA did this as a way of recognizing the distinctions New York dealers were making in their trading between eye clean I1 clarity diamonds and I1 diamonds that were not eye clean. Better, or eye clean I1 stones were simply worth more money than I1 diamonds that were not eye clean. Thus, a new clarity was born from the distinctions that traders made among I1 stones. First Rapaport and then EGL USA recognized those distinctions. GIA never has. The problem for calculating loan value is that we always want to loan as much as we can and so we are tempted to use the SI3 clarity grade. But if we have to sell the diamond, the dealers will want a GIA lab report (EGL is in disrepute) and most SI3 stones will get an I1 grade from GIA. The 1.50 carat round diamond we have been using as an example is worth $900 less as an I1 than an SI3 and we would be unable to recover what we have loaned out.